Hi! 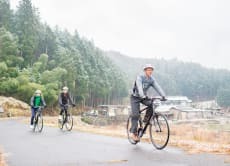 Tono-cycling, as the locally based guided cycling team, will introduce the 'best rural' in the area. Our basic course for Magome starts from JR Nakatsugawa Station, but the suitable arrangement for you is our pleasure. We are looking forward to seeing you all soon!